Code for America’s Integrated Benefits Initiative has been working in partnership with the State of Colorado to demonstrate how user-centered approaches lead to measurably better delivery of safety net programs. 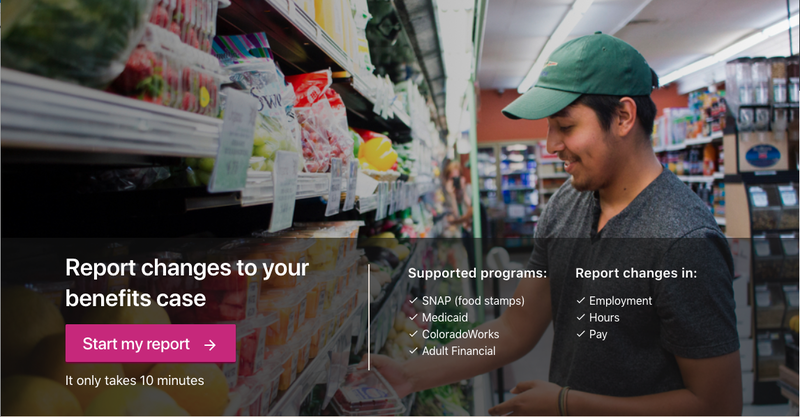 Together, we believe the processes and tools by which clients access safety net programs like SNAP and Medicaid should be simple, effective, and easy to use. The critical first step to modernizing service delivery is to bring the voice of the user into the process, and we’re partnering with Colorado to simplify how clients report all-too-common life changes that may impact their eligibility. At Code for America, our product work centers on simple tools to improve access to government services. 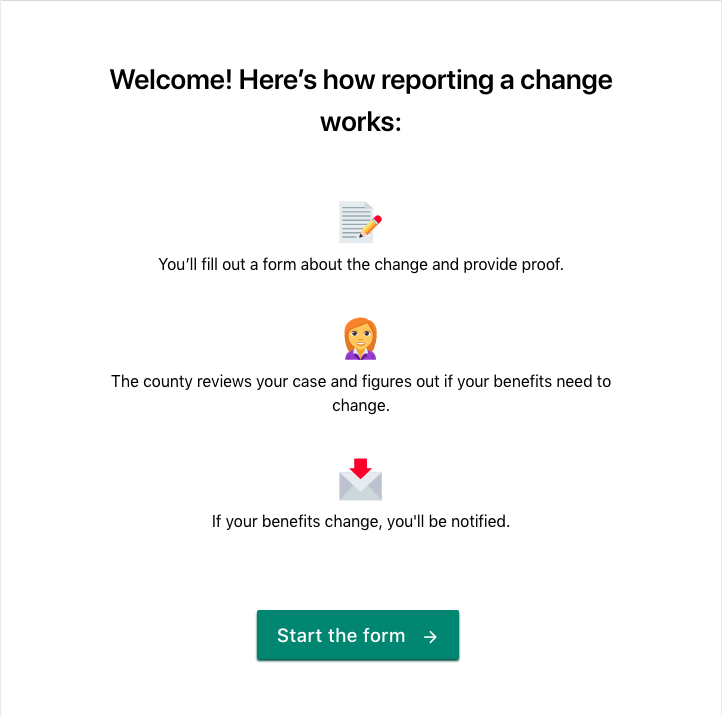 Our pilot in Colorado focuses on the client and worker experience of maintaining access to benefits — and specifically the process of change reporting. That’s it. We selected an intentionally narrow challenge so we can iteratively make progress toward our goals without losing sight of key user needs. We start small so we can carefully consider user needs against other constraints like technical feasibility, policy allowance, and existing operations. At the same time, we create buy-in and common understanding across highly collaborative government agencies and counties in Colorado. This level of focus allows our work to serve as a tangible example for how more agile, user-centered approaches can be replicated and institutionalized in government. While we are only midway through our partnership with the State of Colorado, we are encouraged and energized to work with partners ready to leverage our product work and embrace the principles of delivery-driven government. Our Colorado pilot focuses on making it easier for clients to maintain benefits through common life changes that may impact their eligibility. When we say “maintain benefits,” we mean the process through which clients must report life events or “changes” that may impact their eligibility for assistance — like food or cash. The pilot team led interviews with both clients and caseworkers to surface user needs. 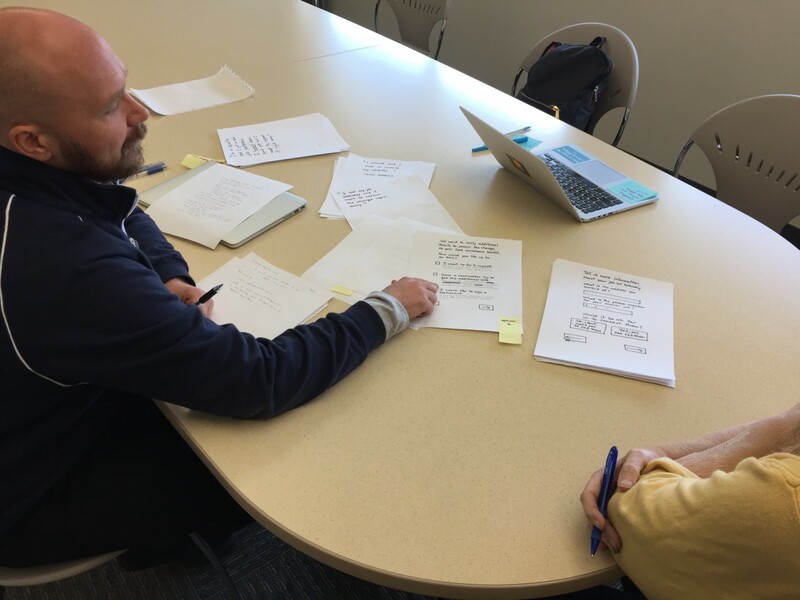 Our research in Colorado highlights the opportunity to improve the client and worker experience by practicing user-centered design. A core observation from this research is how pain points that impact both clients and workers impact the effectiveness, efficiency, and accuracy needed to report or process life changes. Put another way, there is a direct link between client and worker user needs; there’s a need to design a shared product. Throughout our research, we met clients who demonstrated low tolerance for usability issues. People were open about their abandonment of a tool if they struggled to navigate it; instead defaulting to human assistance in-person or by phone. We also observed how common life changes — like an increase in weekly income due to overtime pay — can be difficult to report and not always necessary. There’s a balance to be struck between helping clients to proactively and accurately notify the state about a change and clogging the system with unnecessary or duplicate reports. Our user research also highlighted a mismatch in expectations between how clients perceive reporting within a digital tool and the reality of how changes are processed by workers. Clients intuitively expect an online change report to be updated in “real-time” as is common for other digital experiences like mobile banking or updating a shipping address for an online purchase. In reality, digital change reports follow a sequenced workflow which may require a worker to review and manually process a change to make an eligibility determination. This expectation mismatch highlights the need to build feedback loops into the technology design process to capture input from both clients and workers. This user feedback will not only result in a stronger design and more efficient process, but also enable better collaboration between clients and workers. To test how we can solve for both client and worker needs, while also creating a more connected process between these two user groups, our team is iteratively developing a stand-alone change reporting tool. The pilot tool is testing an improved client-facing experience and an improved worker output that makes changes clearer and more efficient to process. Through the end of the pilot, we will pursue a data integration with Colorado’s system of record, expand the realm of change types the tool captures, and investigate eligibility requirements that are especially challenging to users. To follow our work you can check-out our open Github repository here. The Colorado pilot focuses on technology improvements in change reporting, but that’s just part of our theory of systems change. We believe benefits delivery and policy itself can be driven around user needs. With the help of our Colorado partners across county offices and state-level agencies we are leveraging our technology pilot as a proof point and catalyst for institutional change that ensures the identification of user needs is always considered in technology development. We will collaborate with Colorado on communication plans, process change proposals, and tactical guidance to incorporate the user experience in future technology projects. Together, we will inform a roadmap that helps the state directly implement product recommendations coming out of the pilot while also prioritizing future improvements beyond change reporting. Colorado is one of four state pilots Code for America is leading as part of the Integrated Benefits Initiative. Each pilot focuses on one relatively small but challenging part of the client user journey. Through demonstration of these small but critical human-centered technology tools, we believe we will inspire wider change in how governments consider their approach and vision for benefits administration. We’re privileged to work with partners in Colorado that share this vision. We’ll continue to share our research, collaborative artifacts, and findings as we go. 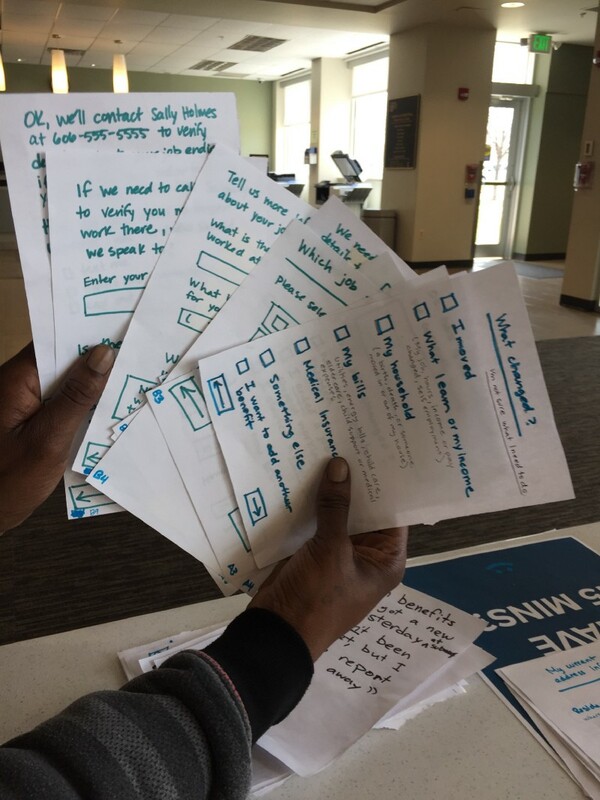 If you have ideas, comments, or best practices that you think would aid us in our work, please reach out: integratedbenefits@codeforamerica.org. I’m leading technology pilots at Code for America aimed at demonstrating a more human-centered social safety net.